What Day Of The Week Was November 1, 1946? 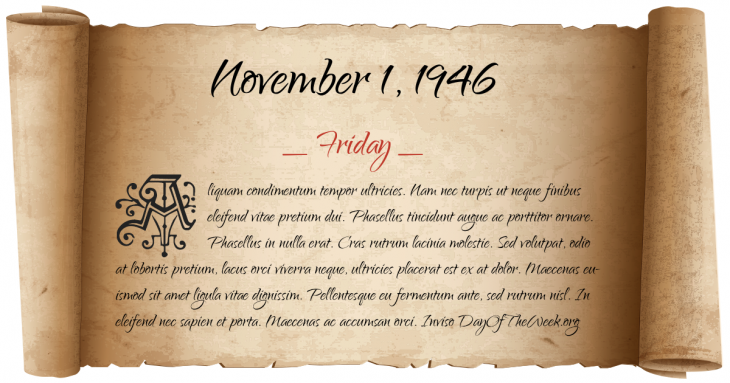 November 1, 1946 was the 305th day of the year 1946 in the Gregorian calendar. There were 60 days remaining until the end of the year. The day of the week was Friday. A person born on this day will be 72 years old today. If that same person saved a Dime every day starting at age 4, then by now that person has accumulated $2,500.60 today. Here’s the November 1946 calendar. You can also browse the full year monthly 1946 calendar. The New York Knicks played against the Toronto Huskies at the Maple Leaf Gardens, in the first Basketball Association of America game. The Knicks would win 68–66. Who were born on November 1, 1946?